Jayne graduated from Glasgow Caledonian University with an honours degree in Physiotherapy in 2006. Upon her graduation she was recruited into NHS Forth Valley’s physiotherapy department where she worked across a broad spectrum of physiotherapy disciplines. During this time, she was also contracted as a team physiotherapist for Scottish Rugby Union and Stirling County RFC where she could explore her passion for sports rehabilitation. In 2012 she progressed from the NHS to the private sector in Surrey with Nuffield Health working in both their fitness centres and private hospitals. Jayne's specialism at this post was musculoskeletal rehabilitation, working closely with a variety of orthopaedic consultants. 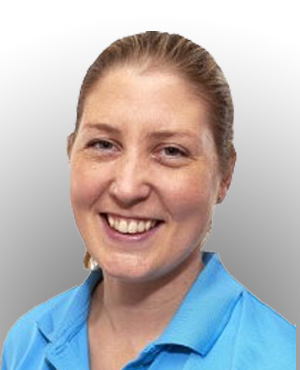 Since 2013, Jayne has worked both for Nuffield and in independent physiotherapy clinics focusing on musculoskeletal and sports injuries. She has continued both of these roles since her return to Scotland in 2015 before founding MacFarlane Physiotherapy in 2016. Jayne is dedicated to the constant improvement of her skills having completed a diploma in massage as well as gaining her Rock Doc ® certification in kinesiology taping techniques. She regularly attends courses to maintain her skills and her portfolio of Continued Professional Development. Jayne's approach to physiotherapy is to work with the client to help them achieve their goals through tailored rehabilitation programs that combine treatment in the clinic with mobilisation, strengthening and flexibility routines that can be performed at home. Jayne asks her clients to work hard to achieve the results they want in a timely manner but knows each client has their own limits and challenges and she works with them to enable their treatment to fit in with their physical and environmental factors.